In Spring 2015, The Shriver Center and UMBC’s Global Studies Program will begin Peace Corps Prep, a pathway for UMBC undergraduates to prepare for Peace Corps Service and other international service and development opportunities. The program is open to all majors. Take a quick study break on Dec. 10th from 12-1 p.m. as representatives from the U.S. Peace Corps and UMBC launch this new and exciting partnership. 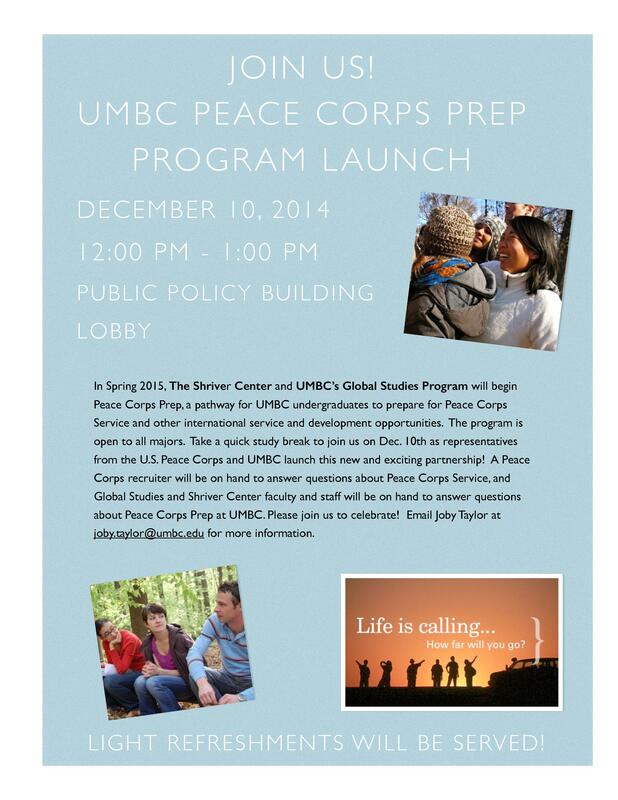 A Peace Corps recruiter will be on hand to answer questions about Peace Corps Service, and Global Studies and Shriver Center faculty and staff will be on hand to answer questions about Peace Corps Prep at UMBC. Please join us to celebrate! Email Joby Taylor at joby.taylor@umbc.edu or visit myUMBC for more information.